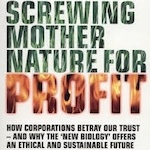 Author and businesswoman, Elaine Smitha joins Jason Hartman to talk about her book, Screwing Mother Nature for Profit: How Corporations Betray Our Trust – And Why the New Biology Offers an Ethical and Sustainable Future. Elaine shares her experience with the natives in Papua, New Guinea, that are affected by pollution from mining companies, which led to the writing of her book. She turned to Mother Nature herself to find solutions for sustainable growth and cleaner air and water. Elaine feels that the start to solving these problems begins with individual consciousness, awareness, and restoring a sense of community. Elaine Smitha is a Drake University graduate and mother of four. In 1969, to expand the influence of art in the community, she created, organized and chaired the first Fine Arts Week in West Des Moines, Iowa, which today is still celebrated. She received the Iowa Arts Commendation for having the Finest Art Craft Department in the State of Iowa. Smitha is included in Who’s Who in American Art and the World Who’s Who in Women. A world traveler with an insatiable appetite for knowledge, Smitha focused on underdeveloped countries to experience the natives’ environment before becoming commercialized entities. Forty countries include the UK, Middle East, North Africa, Far East and South America, tracing the evolution of humanity 10,000 years from Papua New Guinea to China. As author of the self-healing handbook, If You Make the Rules, How Come You’re Not Boss? Minding Your Body’s Business (Hampton Roads, 2003), with foreword by Bruce H. Lipton, Ph.D., Smitha offers the biological imperative to sustain life on Planet Earth is the same for sustainable growth in business and personal performance. Internationally recognized as a “rare media personality”, Elaine Smitha, creator/producer/host of Evolving Ideas© TV, reached a million households weekly in syndicated television markets, including PAX TV. Since 2005 Smitha’s weekly interviews are heard on Dr. Gary Null’s Progressive Radio Network on the Internet. Richard Bach, Bruce Lipton, Deepak Chopra, Larry Dossey, Fred Alan Wolf, Amit Goswami, Ervin Laszlo and Jack Canfield are among the guests who have appeared on her shows. Elaine Smitha is a multitalented professional speaker for businesses, universities, colleges and prestigious organizations around the country including World Future Society, Creative Problem Solving Institute and the International Conference on Global Security Safety and Sustainability held at the University of East London.